Twenty-three miles north of Chicago’s Downtown Loop area, Highland Park extends along beautiful Lake Michigan for about five miles. 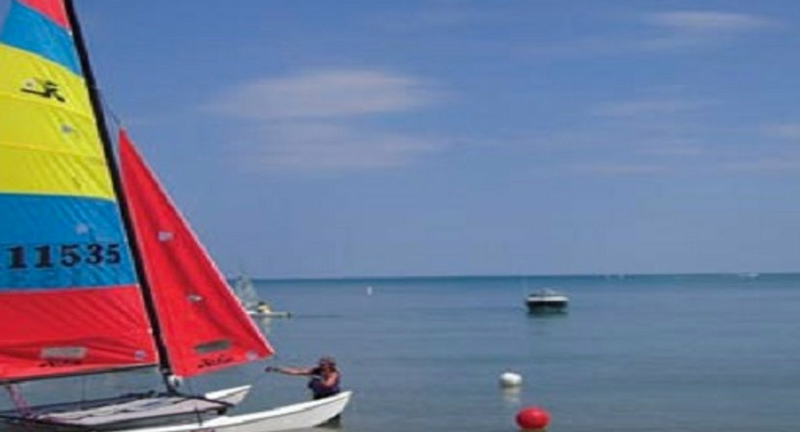 Approximately 12.5 square miles in area, Highland Park is a lakefront community on the North Shore that offers many natural amenities, including ravines, lakeshore and trees, as well as lovely homes with distinct architectural and historic character. It has affordable housing and an ample supply of both single-family and multi-family residences. Although the city’s lakefront location is considered desirable, the cold Chicago winter weather is decidedly not. An effective way to beat the cold is by installing radiant floor heating in your home. Any room in the home can benefit from warm floors but living rooms in particular are an ideal choice because the family gathers there. These Highland Park homeowners were remodeling their living room by replacing their carpet with engineered wood flooring and they wanted to enhance the rooms livability by adding underfloor heating. To incorporate the floor warming, the homeowners installed two 1.5- by 30-foot Environ™ Flex Rolls in their 131-square-foot living room for $856.00 at a cost of just $9.51 per square foot (see floor plan). The cost to operate the system should also be considered when planning your budget. WarmlyYours’ Energy Use Calculator shows it only costs 41 cents per day to heat this living room for eight hours a day and according to our Heat Loss Calculations, it costs just $23.35 to heat the living room during the coldest month of the year. Best of all, the annual operating cost for the heated floor is $115.90 — a small price to pay for the comfort and luxury of a radiantly warm living room with soothing warm floors. An added benefit is that the radiant heating system can be the primary heat source for the room so there’s no need for additional heating. Can Radiant Heat be your Primary Heat Source? Let's find out. It’s easy. WarmlyYours’s Heat Loss Calculator will ask you a few questions about your desired room temperature, how well your room is sealed, and other parameters to determine how much heat is being lost. Then it will calculate the heat loss to see if radiant floor heat can be your primary heat source. In this case, the living room is located above a heated basement space and the ceilings in the room are 9 feet. Based on WarmlyYours’s Heat Loss Calculations, a floor-heating system can be the primary heat source for this room so no additional heating will be necessary which is a considerable utility cost and energy savings. If the room had poor sealing factors, radiant floor heat would have been recommended only as a supplementary heat source. To discover if radiant heat can be your room’s primary heat source, explore WarmlyYours’s Heat Loss Calculator for yourself! If you’re curious how much your living room or any room where you’d like floor heating costs, you can use our Instant Quote Tool to quickly find that out. Simply enter your project information to receive the product recommendations along with each cost. In addition, our SmartPlan™ installation plan will specify all the applicable information you will need to get your project smoothly underway. To obtain a custom installation plan for your room, you can submit a floor plan online, send it to your account manager via email (sales@warmlyyours.com) or fax at (800) 408-1100. If you are a DIYer and prefer installing the system yourself, we’ve got you covered by offering 24/7 installation support to guide you through each step of the process. Our technical experts are available day and night for your convenience at (800) 875-5285. WarmlyYours is committed to be there for you whenever you need us. Next Post Can Underfloor Heating be a Room’s Primary Heat Source?